Sometimes a Traveler represents the combined curatorial work of a team of dedicated scholars within Hampshire College’s Institute for Curatorial Practice (ICP): Noah Street Dickerman, Nikolai Humphrey-Blanco, Emma Jacobs, Riley Kleve, Kwasi Tre’, and Charles Weisenberger. The Institute is a five week intensive study program that focuses on the interrogation of contemporary modes of curation and the combination of these modes with new forms of media technology. 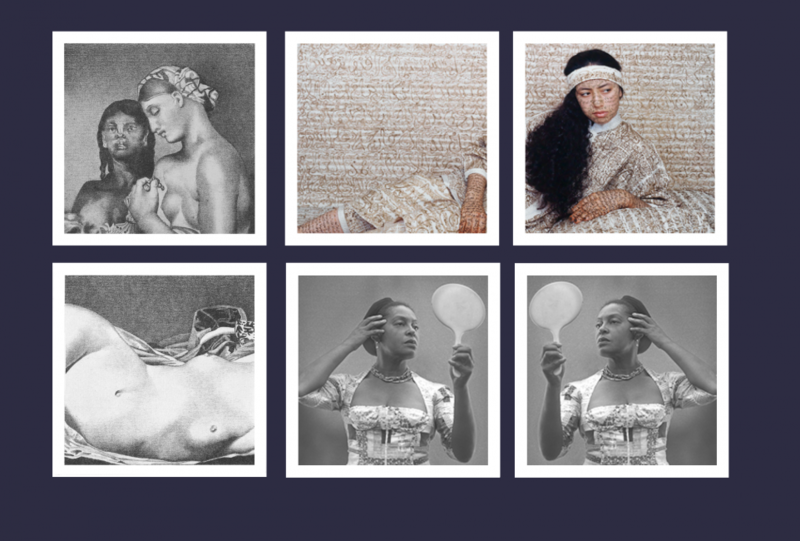 Focusing on the study of objects in the Five College Museum Collections and those from other institutions, the ICP emphasizes the accumulation of theoretical, historical, and media design skills, as well as the larger conceptual frameworks that allow these talents to be displayed in the digital realm. Due to the accessibility of the internet, an online curatorial project presents us with the unique opportunity to reach a larger viewer base. This allows our work to become not only a curatorial endeavor but also a call to greater social awareness of the misrepresentation of Women of Color by the predominantly white, male artists who have historically sought to create images of femininity that cater to colonial sensibilities. The content that we have curated here exists to highlight the contemporary art of Women of Color who complicate, divert, and appropriate this colonizing gaze in order to reassert their agency and reaffirm their subjectivity beyond the Western, male assumptions that have consistently attempted to objectify and fetishize their bodies and identities.